DEP Interim Secretary Ryan Matthews joined First Lady Ann Scott, the Florida Department of Education and the Florida Lottery at the event in the Governor's Mansion. 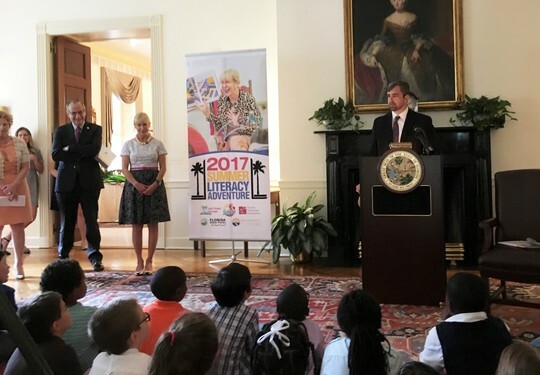 TALLAHASSEE, Fla. – Today, First Lady Ann Scott welcomed more than 30 students from Springwood Elementary School to the Governor’s Mansion for the seventh annual Summer Literacy Adventure kick-off. The Summer Literacy Adventure challenges students to pledge to read as many books as possible over the summer, with the goal of students maintaining and improving upon the skills they gained during the previous school year. For the seventh consecutive year, First Lady Ann Scott will share her passion for reading with summer camp students during fun-filled events at Florida state parks in June and July. The 2017 Summer Literacy Adventure is made possible through a partnership between the Florida Department of Education, the Florida Department of Environmental Protection and the Florida Lottery. Research shows that children who do not continue reading through the summer can lose a month or more of progress made during the school year. By encouraging children to read, parents are playing a critical role in achieving Florida’s goal of having every child reading at or above grade level. Children can pledge to make summer reading a real-life adventure here. The Florida Department of Environmental Protection is the state’s principal environmental agency, created to protect, conserve and manage Florida’s environment and natural resources. The department enforces federal and state environmental laws, protects Florida’s air and water quality, cleans up pollution, regulates solid waste management, promotes pollution prevention and acquires environmentally-sensitive lands for preservation. The agency also maintains a statewide system of parks, trails and aquatic preserves. To view the department’s website, visit www.dep.state.fl.us.